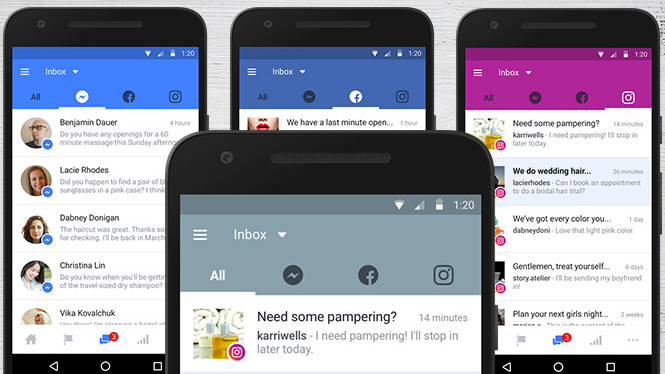 Facebook is rolling out a unified inbox for businesses to manages communications across all of their social platforms; Facebook, Messenger and Instagram. This allows businesses to save time by only having to open only one app to send and receive messages. Now, Facebook says you can reply to Facebook comments, visitor posts, reviews, messages and Instagram comments directly from the updated inbox by tapping on the content you want to answer. Of course, you can still use the apps directly as well. The unified inbox will roll out to anyone using the business focused Pages Manager mobile app over the next few weeks. Facebook says it will be available for all other devices soon as well. To make it work simply connect your Facebook and Instagram accounts by clicking on the messaging icon at the bottom of your Page while you’re in the Pages Manager App which will then prompt you to login into Instagram. Facebook says it will be adding additional features that make sense to make it more useful for business. In the app you can also click to see a basic profile of anybody you are communicating with including any previous interactions with your company. This lets you keep your messaging more personal and effective.